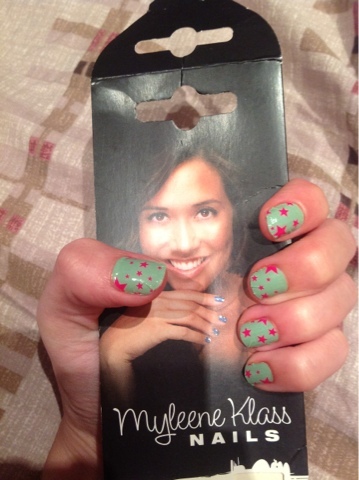 I didn't know Myleene Klass made nails?! 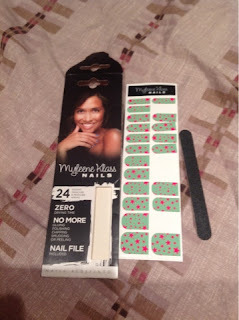 Time2Try so if you havn't used nail wraps before we will guide you through. Myleene Klass has a number of different styles but today we are using green / pink stars for a fun, casual look. In the pack you get a range of 24 different sized nail wraps and the pack comes with a nail file included. They retail at £5.99 from JML Direct, ASDA and Boots. Step 1. Choose a nail wrap that's best fits your nail size and shape. Step 2. Carefully peel the nail wrap off the backing strip. Step 3. 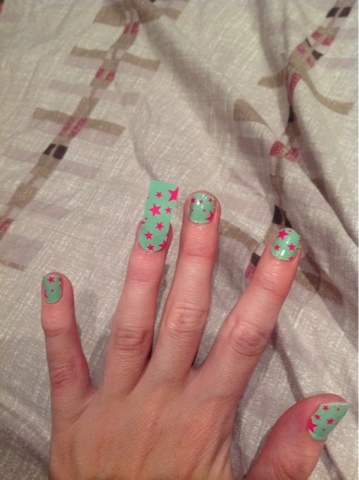 Place the rounded end of the nail wrap up against the cuticle. Step 4. Start at the cuticle, press the wrap firmly over the nail and smooth out any creases. Step 5. Press down on the wrap then stretch the excess over your nail tip. File away any excess wrap in a downward motion.